"Alexander's work on studying cosmic reionization - the process of ionization of the bulk of cosmic gas by ultraviolet radiation from the first stars and quasars - was instrumental in combining diverse theoretical concepts into a single, unified paradigm that connects directly with modern state-of-the-art numerical simulations. This breakthrough will have numerous practical applications for the analysis and interpretation of the forthcoming observational data from the future James Webb Space Telescope, Giant Magellan Telescope, and radio observations of the epoch when the first galaxies lit up." Thesis Abstract: As the sensitivity and precision of modern instruments increases, the observations start to approach two digit redshifts, which is a mid-reionization epoch. In the upcoming decade we expect to have many of highly diverse observations of the epoch of reionization. Those observations will include: 21cm global signal and tomography experiments, improved CMB polarization measurements, the properties of individual galaxies including Lyα emitters, and the ionization state of the IGM through observations of the spectra of high-z quasars. Even though for each of these observations theoretical models are already developed; there is no unified theoretical framework to analyze them altogether in a self-consistent way, i.e. to perform a full Bayesian analysis of all available observations. Therefore, I would like to discuss why it is still an unsolved problem and how it can be approached. In particular, I will talk about our latest developments in numerical simulations of cosmic reionization with full radiation transfer, and their interplay with approximate semi-analytical methods. Most importantly, I will review possibilities for the parameter spaces used in reionization models. In addition, I will present our recent results on more exotic reionization scenarios that include dark matter annihilation. "Laura conducted the most ambitious observational programs ever on the topic of exoplanet atmospheres for her dissertation. She used large investments of Hubble and Spitzer Space Telescope time to measure exoplanet atmospheric compositions, thermal structures, energy budgets, and dynamics to understand planetary origins and physics. The papers resulting from her work are the new benchmarks in the field, and provide a foundation for studying the atmospheres of potentially habitable planets with future facilities." Thesis Abstract: Exoplanet atmosphere characterization has the potential to reveal the origins, nature, and even habitability of distant worlds. This thesis represents a step towards realizing that potential for a diverse group of four extrasolar planets. Here, I present the results of intensive observational campaigns with the Hubble and Spitzer Space Telescopes to study the atmospheres of the super-Earth GJ 1214b and the hot Jupiters WASP-43b, WASP-12b, and WASP-103b. I measured an unprecedentedly precise near-infrared transmission spectrum for GJ 1214b that definitively reveals the presence of clouds in the planet's atmosphere. For WASP-43b and WASP-12b, I also measured very precise spectra that exhibit water features at high confidence (>7 sigma). The retrieved water abundance for WASP-43b extends the well-known Solar System trend of decreasing atmospheric metallicity with increasing planet mass. The detection of water for WASP-12b marks the first spectroscopic identification of a molecule in the planet's atmosphere and implies that it has solar composition, ruling out carbon-to-oxygen ratios greater than unity. 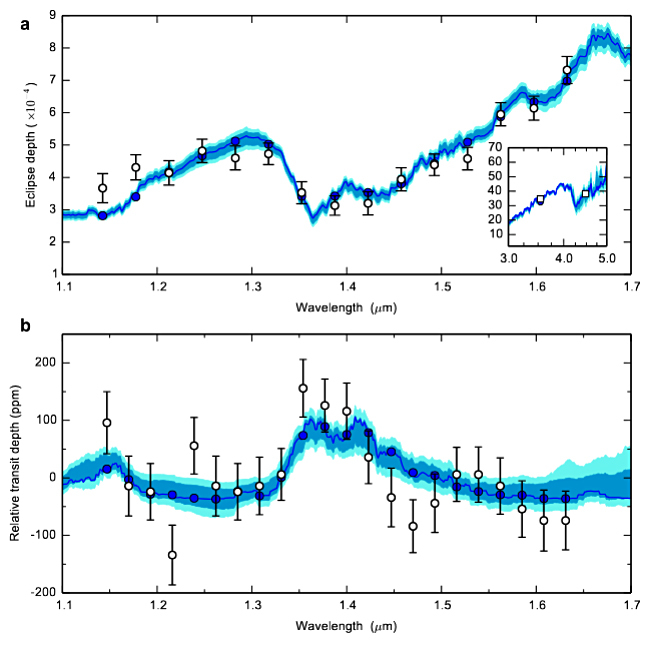 For WASP-103b, I use the new technique of phase-resolved spectroscopy to determine the planet's temperature structure, dynamics, and energy budget. In addition to these observations, I also present the BATMAN code, an open-source Python package for fast and flexible modeling of transit light curves. Taken together, these results provide a foundation for comparative planetology beyond the Solar System and the investigation of Earth-like, potentially habitable planets with future observing facilities. Thesis Abstract: The Holometer program is a search for first experimental evidence that space-time has quantum structure. The detector consists of a pair of co-located 40-m power-recycled interferometers whose outputs are read out synchronously at 50 MHz, achieving sensitivity to spatially-correlated fluctuations in differential position on time scales shorter than the light-crossing time of the instruments. Unlike gravitational wave interferometers, which time-resolve transient geometrical disturbances in the spatial background, the Holometer is searching for a universal, stationary quantization noise of the background itself. This dissertation presents the final results of the Holometer Phase I search, an experiment configured for sensitivity to exotic coherent shearing fluctuations of space-time. 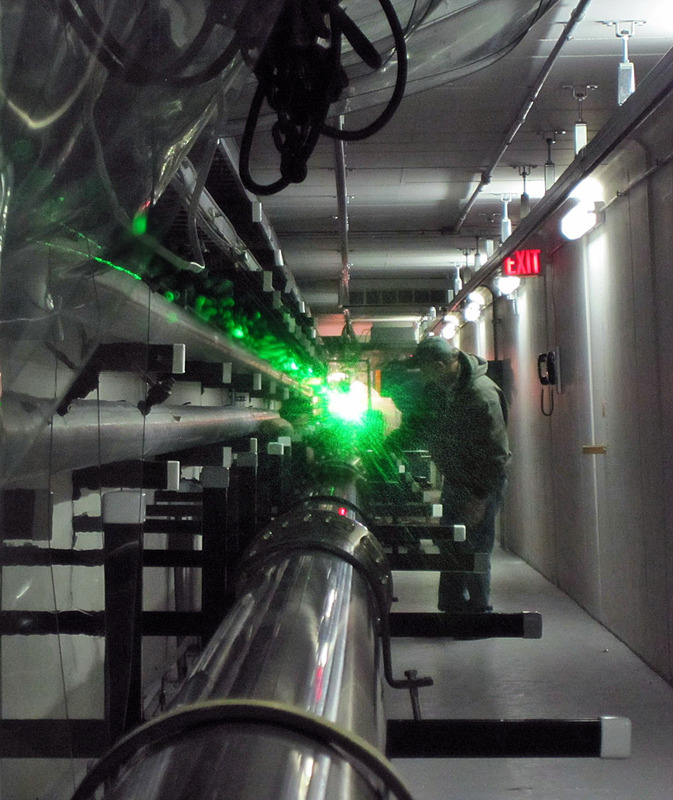 Measurements of high-frequency cross-spectra of the interferometer signals obtain sensitivity to spatially-correlated effects far exceeding any previous measurement, in a broad frequency band extending to 7.6~MHz, twice the inverse light-crossing time of the apparatus. This measurement is the statistical aggregation of 2.1 petabytes of 2-byte differential position measurements obtained over a month-long exposure time. At 3-sigma significance, it places an upper limit on the coherence scale of spatial shear two orders of magnitude below the Planck length. The result demonstrates the viability of this novel spatially-correlated interferometric detection technique to reach unprecedented sensitivity to coherent deviations of space-time from classicality, opening the door for direct experimental tests of theories of relational quantum gravity. Ph.D. Committee members: Andrey Kravtsov, Rich Kron, John Mulchaey, and Don York. Thesis Abstract: Galaxies are thought to grow through star formation that is fueled by the accretion of gas in dark matter halos and from intergalactic space. 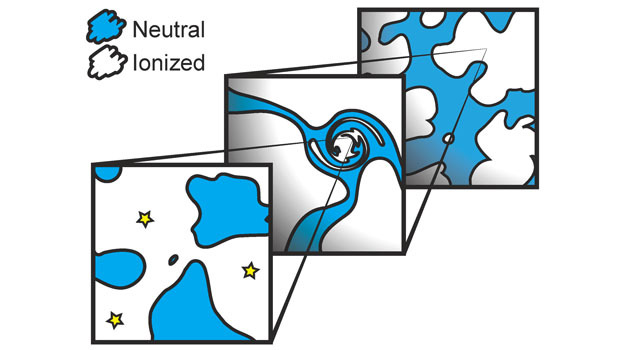 In turn, star formation and active galactic nuclei drive outflows that regulate gas cooling and accretion while enriching the surrounding gas with heavy elements. The resulting enriched gaseous halos that surround galaxies are thought to dominate the baryon reservoirs capable of fueling future growth, and developing an empirical understanding of the relationship between galaxies and this surrounding gas consequently represents a key step toward a more complete understanding of galaxy evolution. The diffuse nature of galaxy halo gas renders direct emission too faint to be detected with current facilities except in extreme cases, but the gas can be readily observed as absorption features in the spectra of UV-bright background sources such as quasars. I will present a series of observational studies that provide new insights into the relationship between galaxies and surrounding diffuse baryon reservoirs through combined galaxy redshift and quasar absorption line surveys. The survey results highlight the role of galaxy environment and active galactic nuclei in galaxy evolution and their possible relation with extended halo gas reservoirs.